Do you have a small kitchen in your home, townhome, condo, or apartment that you would like to remodel? Maybe you have a small kitchen in an in-law suite or basement suite that you'd like to update? Most small kitchens are often a "galley" style kitchen or otherwise known as a corridor kitchen. They are laid out like a hallway with kitchen counters on either side. One counter often has all of the amenities like a sink, dishwasher, and stove and the opposite side usually houses the cabinets, storage, and the main counterspace for meal prep. Small kitchens can pose a challenge for any remodeling contractor but with a little bit of ingenuity and some creative planning your small kitchen can still be a nice looking, modern, kitchen that will be a dream to prepare meals in and use. Let's face it, your small kitchen isn't going to be the entertainment hub of your home, you won't be working in it, kids won't be doing their homework in it, and you'll really only be using it for meal preparation, it makes sense to make the space the best it can be for how you'll be using it most. 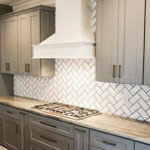 Kitchen Lighting - In any kitchen great lighting is very important but with a smaller kitchen you don't want to have large light fixtures that actually make the space look smaller. Consider small track lighting or even recessed pot lights or hidden under cabinet lighting to give the interior of your kitchen a clean and streamlined look. Large light fixtures hanging from the ceiling will only make your small kitchen feel smaller than it actually is. Tiling Your Kitchen Floor - If you'd like a tile floor in your kitchen, it's often a better choice for a small kitchen to choose larger, lighter colored tiles. Small tiles can give the illusion that your kitchen is too busy and cramped. Dark colors only magnify this effect. By choosing larger tiles that are lighter in color you'll have less grout lines and a cleaner look to your kitchen. 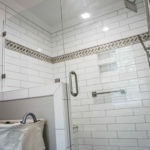 One thing to be careful of with larger tiles in a small kitchen is that you don't have a grout line running right next to and parallel to the cabinets, this can look odd and out-of-place. Space Saving Appliances - There are so many modern appliances designed around saving space it makes perfect sense to take advantage of them. If you're working with a small kitchen it might not be such a good idea to have the big, double door fridge and freezer combo unit, instead choose a slimmer fridge with a single door and the freezer on the bottom. You'll be thankful for the extra counter space this allows. There are dishwashers with smaller profiles, stove tops, and ovens that are all designed for the smaller kitchen space. More Open Storage Space - Closed off kitchen cabinets, especially in a smaller kitchen, contribute to the cramped feeling. Consider having open cupboards or open shelving that is equally spacious to store pots and pans and other goods or utensils but gives the illusion of a more open and airy space. Carefully Choose Your Materials - One benefit to a smaller kitchen is the reduced amount of materials required. Your countertops are smaller, your cabinets are smaller, the square footage of the floor is smaller, so when compared to remodeling a much larger kitchen, your cost for materials can be significantly reduced. 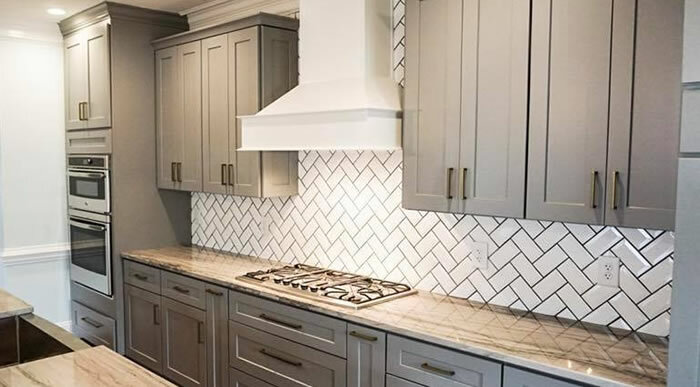 This means you can likely consider more luxury materials such as granite or quartz for the countertops and maybe even a beautiful tile backsplash behind your stove or sink and more luxurious flooring. Choose Lighter Colors - Color plays an important role in your kitchen and choose the right colors can make the space feel more open and light. Consider pastels or light colors with a healthy amount of white. White reflects light and can help make the room seem larger than it really is. This goes for the color of your walls, your cabinets, your countertops, and even the accessories in your kitchen like dishtowels. The right colors help change the atmosphere. 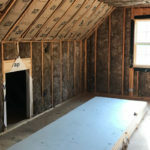 Windows or Skylights - It's not always a possibility if your small kitchen is in a townhome or a condo but if you have a cottage with a small kitchen don't overlook the possibility of adding a window or a skylight. A window like a new garden window or a bay or bow window will extend outward from the home and vastly increase the space in your kitchen. The new window sill can be used as a place for storage or even growing a small herb garden. Skylights are equally effective increasing the perceived space in your kitchen and they also let in lots of natural light. Are You Looking For More Small Kitchen Remodeling Ideas? Maybe it's time to book a consultation with the professionals at Branch Home Improvement LLC. We have extensive experience remodeling small kitchens for our clients and after having a look at your space and listening to your needs we can come up with a few different solutions that will transform your small kitchen into a more modern and enjoyable space to work in. You contact us and schedule your consultation. (it's free). We'll come out and view your kitchen. We'll listen to your needs and wants. We'll offer suggestions or ideas you likely haven't thought of. We'll put together an estimate based on our consultation. You can decide if you'd like to hire us to do the work! In a week or two you can have a beautifully remodeled modern kitchen that won't seem so small and will maximize every inch of available space! Branch Home Improvement LLC Remodels Small Kitchens Throughout Wake County, North Carolina. The team at Branch Home Improvement can remodel the small kitchen in your Holly Springs, Cary, or Apex home. We are based out of Holly Springs and serve the entire NC Triangle. Your kitchen remodel will be in the experienced hands of our team and when it's all done you'll be amazed with the results. If you'd like to schedule a remodeling consultation for your small kitchen please give us a call (919) 995-6325 or fill out our contact form and we'll get right back to you. Words cannot express how satisfied I was with hiring branch home improvements for my floor renovation. Their attention to detail had me in awe of the workmanship. Not only is their work superior to anything I've seen but also wanted to comment on how respectful these contractors were to my home while working. Just great guys doing great work!! Beyond happy with the final outcome and will call for all my home projects from now on.